So you’ve done your keyword research, created awesome landing pages, and made ads that point to those pages. Great job! But the work doesn’t stop there. 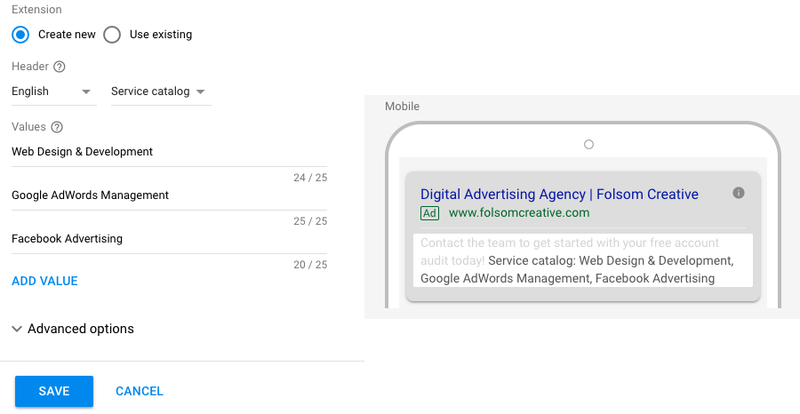 To create truly engaging ads that attract more users, you’ll want to add ad extensions that are tailored for your type of business. To add extensions, navigate to your AdWords account, and on the left sidebar select: “Ads & extensions”. From there, you’ll be taken to a screen that shows all of your ads. At the top navigation, select “Extensions” then click the + button to add an extension of any type. Not all extensions are right for your business, so read on to ensure you’re using the most relevant extensions. What are they: Sitelink extensions can take people to specific pages on your site—your store hours, a specific product, or more. 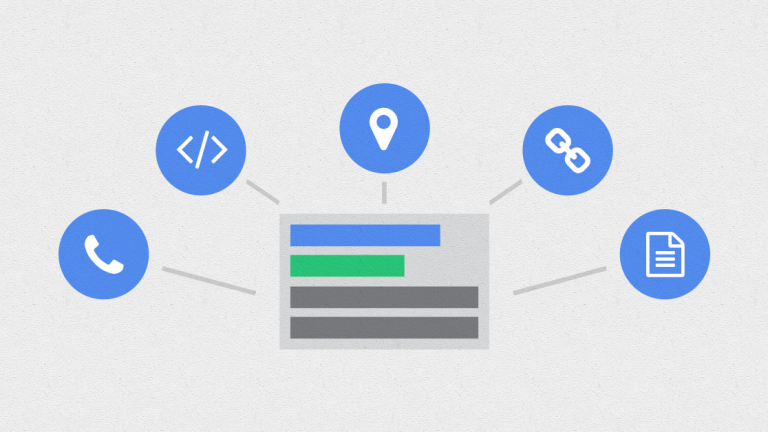 When someone clicks or taps on your links, they skip right to what they want to know or buy. How to set them up: As seen below, on the left panel, we set up a sitelink extension to point to a blog post “5 Common Website Mistakes”. This is an ad about Web Design, so this page would probably be relevant for someone thinking about getting a new site. Along with that, we have extensions which direct to our Consulting page, Portfolio, etc. What are they: Callout extensions let you include additional text so you can show more detailed information about your business, products, and services. When to use them: Details matter. Including details relevant to your business can weed out irrelevant users who may be looking for something else. They can also highlight areas of strength for your business. For example, if your business offers free shipping, 100% satisfaction guarantees, or 24/7 customer service; these would be great things to highlight in your callout extensions. How to set them up: These are perhaps the most simple to set up. Simply enter the text you want to highlight in the provided line, and it’ll appear after your description. What are they: Structured snippet extensions highlight specific aspects of your products and services with structured snippets extensions. Structured snippets show beneath your text ad in the form of a header (ex: “Destinations”) and list of values (ex: “Hawaii, Costa Rica, South Africa”). When to use them: If you are a business where the details of your services can be a major selling point, then you’ll want to use structured snippets. This extension type is commonly seen for hotels, as small variations in amenities can be the difference to a user. (i.e. Amenities: Free Wifi, Breakfast, Pool, Gym, Airport Transfers, Parking.) Not all hotels provide pools, gyms and the like, so if you do, highlighting them in your structured snippets can make all the difference. How to set them up: You will be given the option to select the category that you are highlighting, along with the language. For us, we chose “service catalog”, but your business may want to use “Amenities”, “Brands”, “Courses”, etc. 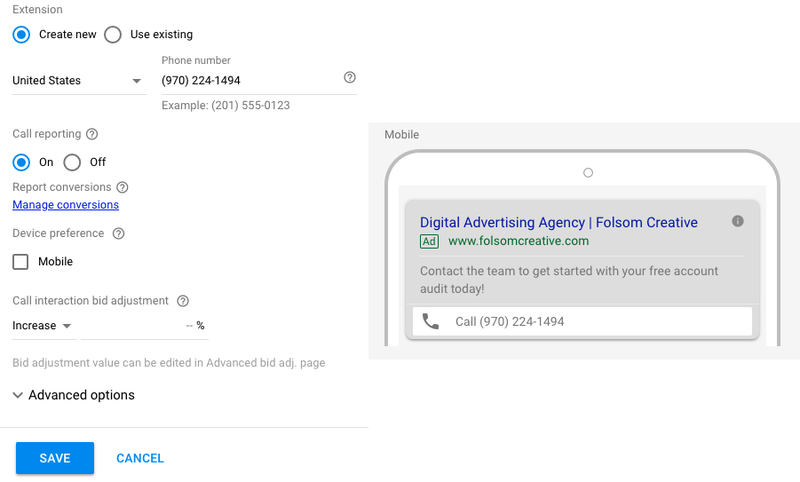 What are they: Call extensions let you add phone numbers to your ads, which can significantly increase clickthrough rates. When your call extensions show, people can tap or click a button to call your business directly. When to use them: If you are a business where phone calls are an important step in converting visitors to customers (i.e a law firm, a doctor’s office, etc.) then call extensions are a no-brainer. Many times, if a user already knows what they want, they will skip the step of browsing your website and immediately give you a call to set up an appointment or receive more information based on their situation. This applies in particular to law firms, as it’s easier for many clients to explain their situation to an attorney over the phone to hear how he/she can help the client’s particular situation. What are they: Location extensions can help people find your locations by showing your ads with your address, a map to your location, or the distance to your business. When to use them: If you are a local business focusing on attracting local foot traffic, these are among the most important extensions. This is most relevant for retail shops, restaurants, chiropractors, etc, as customers tend to make their local shopping decisions based in part on proximity. Highlighting that you’re in their area will increase your chances of converting a particular user.